Rowling End & The Mouse House7584138682work Self-cateringRowling End is a family sized, traditional Lakeland house. Rowling End House has been lovingly restored and in July 2009 it was awarded a 5-star VisitEngland rating. The understated luxuriousness is complemented by a large farmhouse kitchen with an Aga and open fires in each of the sitting rooms. Rowling end consists of 4 bedrooms, 2 with en suite bathrooms, 2 king-sized doubles and 2 twins. An additional large family bathroom with shower and roll top free standing bath. 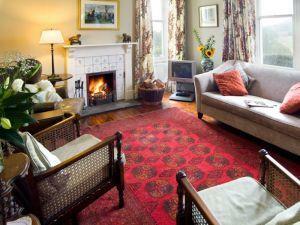 Two lounges to relax in with open fires, logs supplied and TV & DVD players. A kitchen/dining room with oil-fuelled Aga, also an electric oven and hob, American- style fridge freezer, dishwasher & microwave and a large dining table. A drying room/utility room for outdoor gear, also with a washer/dryer. A further cloak room with WC and wash basin. Outside the cottage there is a storage shed for the logs, which are supplied and a storage shed for bikes. The Mouse House is an idyllic retreat for up to 2 people. Formerly a traditional Lakeland stone barn from when Rowling End was a farm, it has been sympathetically developed as a 1-bedroomed cottage and in July it was awarded a 4 star VisitEngland rating. The Mouse House consists of a bedroom on the top floor with a zip bed so you can request either a king-size bed or 2 single beds. A large shower room with walk in shower, sink and WC. An open-plan lounge with a TV and DVD player. A kitchen, open plan with the lounge, which has a built in oven, grill, microwave & hob, fridge with freezer and dishwasher also a washer/dryer. Rowling End & The Mouse House offers weekly bookings starting on Friday and sometimes short breaks. Rowling End is a family sized, traditional Lakeland house. Rowling End House has been lovingly restored and in July 2009 it was awarded a 5-star VisitEngland rating. The understated luxuriousness is complemented by a large farmhouse kitchen with an Aga and open fires in each of the sitting rooms. Rowling end consists of 4 bedrooms, 2 with en suite bathrooms, 2 king-sized doubles and 2 twins. An additional large family bathroom with shower and roll top free standing bath. This cosy cottage for 2 is perfect for romantic breaks in the Lake District, singles or friends. The cottage is fully central heated and pets are welcome. No real log fire in The Mouse House. Children welcome from any age. From M6 jct 40 head towards Keswick. Bypass Keswick and take left turning into Portinscale/Newlands Valley, continue through Portinscale and approximately 1.5 miles turn right towards Swinside/Stair/Newlands Valley/Buttermere. Go through Stair and head towards Buttermere just past the guest house called Ellas Cragg, you will see a large gate on your left with a sign Rowling End, this is the private drive you go down to the properties.